MIRRC Human Trafficking Conference Comes to Lansing - DCF Anti-Drug and Trafficking, Ink 501(c)3 & Michigan Rescue and Restore Coalition Educating, Engaging and Empowering Advocates Against Human Trafficking, Substance Abuse and Homelessness. Website Under Construction - Please Review! Taking Steps to Eradicate Slavery: Revealing the Truth, Recognizing the Crime, Preparing a State to Fight for Justice! Welcome to the first Human Trafficking Conference hosted by MIRRC on the campus of Great Lakes Christian College located in Lansing, Michigan. 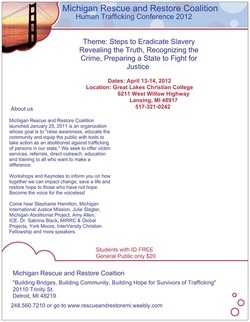 What a great opportunity to help raise more awareness on the efforts of not just us but others in the great state of Michigan to collaborate to educate and equip the community to take action against trafficking. The conference will be April 13-14, 2012 with workshops by topnotch presenters Dr. Sabrina Black, Nikki Jackson, Amy Allen, Julie Slagter, E. Christopher Johnson who will give you a taste on diverse topics which will engage and compel you to want to work for the cause. Keynote speakers is a wonderful display of dynamic presenters, York Moore from InterVarsity Christian Fellowship and Dr. Robert Hagerty, president of Mercy for the Children-Mynamar. These men whose experience is enlightening will take you to a whole new level of awareness and action. Let's dialogue on how we can strategically protect our women and children in our cities. Join us as we make a difference and save a life and restore a life to wholeness through our conscious work throughout Michigan. If you are ready to do a new thing that will produce new hope for the hopeless, and become an advocate and voice for the voiceless, come to this conference and get equipped to bring help to those who have been bound by this atrocity against humanity.